1-2 drops in the conjunctival sac two to four times daily. During the initial 24 to 48 hours the dosage may be safely increased to 1 drop every hour. Care should be taken not to discontinue therapy prematurely. FML-T is effective in the treatment of infectious conjunctivitis due to organisms sensitive to Tobramycin. FML-T may be used for the treatment of the anterior segment inflammatory disorders which may be threatened with or complicated by bacteria sensitive to Tobramycin. FML-T is effective following removal of foreign bodies as well as before and after surgery where the possibility of infection with susceptible organisms exists. 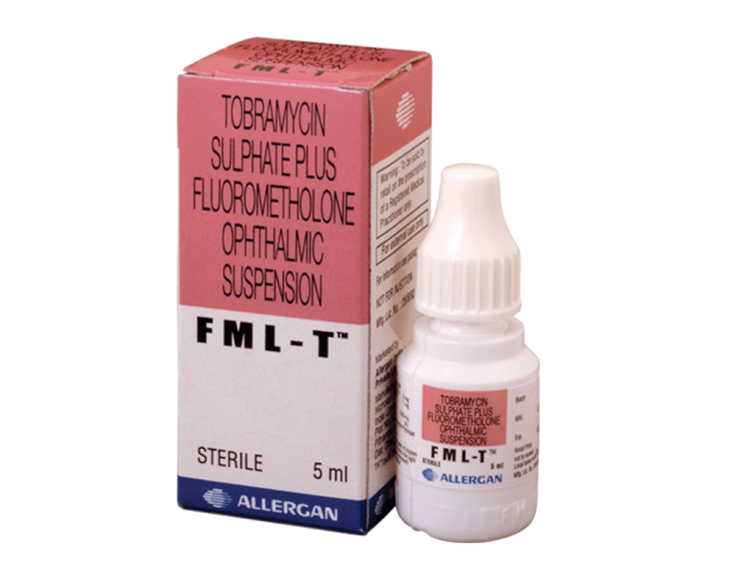 FML-T™ (Tobramycin sulphate plus Fluorometholone ophthalmic suspension) is supplied in sterile 5 mL plastic dropper bottle.